The California sea lion has thick fur plus a dense layer of under-hairs that stay dry when the animal is underwater and a thick layer of blubber to help maintain its body temperature. The males can weigh an average of 800 pounds and are seven to eight feet long, females weigh less, about 200 pounds and measure an average of five feet in length. The mature males have dark red or chocolate brown fur that appears black when wet; females have a light brown fur coloring. Males develop sagital crests, bony bumps on the top of their skulls that turn lighter as they age. A long snout gives the California sea lion an almost dog like face. The sea lions habitats are Bays, estuaries and waters near shore, from southern Mexico to southwestern Canada. Most of population migrates to southern California and Baja peninsula during the breeding season. Females are joined by males during the breeding season, which is May-August. 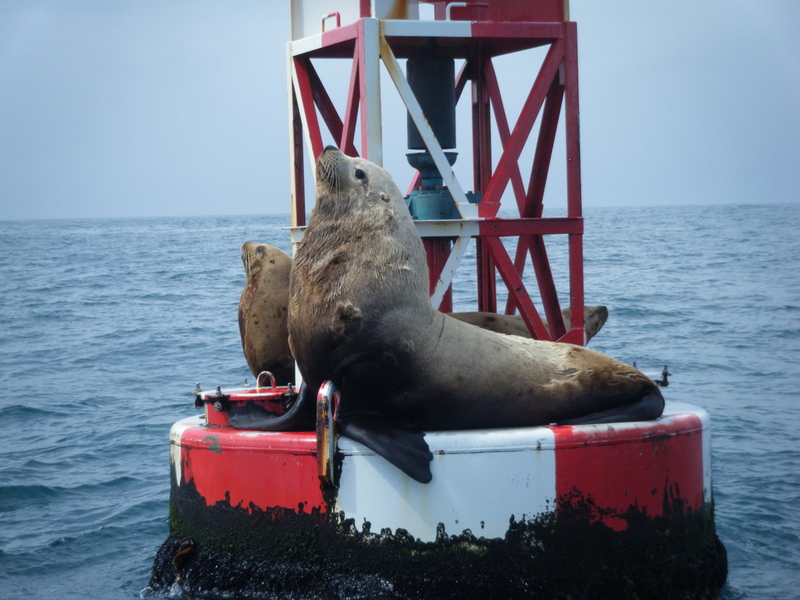 Males migrate to winter feeding areas off Oregon, Washington and Canada, sometimes taking over docks and piers. They seldom travel more than 10 miles offshore and usually haul out on beaches or rocky shorelines in groups. 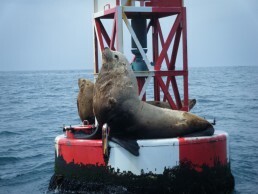 If you have ever been whale watching on the Whales Tail you know that they also love to hang out on Depoe Bay’s buoys. At times you will see them floating together on the ocean surface, with flippers in air, in an action called “rafting”. Sea lions are very vocal, and make barking like sounds. Their diet consists of Squid, Octopus, schooling fish, rockfish, and salmon. Their lifespan is about 17-18 year’s, their predators are orca whales and great white sharks.